Some people have felt a little underwhelmed with this season of Sleepy Hollow. Personally, I think this season has done a good job of building up tension and digging into the character pasts and motivations a bit more. Though whatever you thought of the episodes leading up to this, “Magnus Opus” returned us to the rush and fear of last season and has set the stage for a Mid Season finale of Apocalyptic proportions. It’s been said before one can progress, they must “know thyself completely”. So let’s take a closer look a this past episode in preparation for next week. The theme of this episode was all about knowing thyself. While on the quest for the legendary Sword of Methuselah, you not only had to a Gorgon – without facing it – but also had to cast all illusions aside and come to terms with your “truest face”. Though it wasn’t just the quest that revealed this; but the episode as a whole as we saw each character’s outer displays banished and we saw into their true selves. Despite his escape and now fugitive status, we’ve learned that Irving isn’t going to run or risk bringing harm to Jennie or anyone else. Instead we will stay and fight from the shadows – revealing him to still be a good man. Abbie and Ichabod found that their “truest face” lies in the eyes of the other. Whereas some could take this to be romantic, it’s actually more of a testament to their friendship and how they must have faith in each other when everything around them makes them doubt themselves. Similar revelations were made on the side of evil where Henry dispelled the necklace’s enchantment to reveal Moloch’s full form. Additionally, Henry called out Katrina as being too compassionate for her own good. This is something that we’ve actually seen quite a bit of this season. Despite all of Katrina’s powers and status as witch and spy, she appears to be more of a damsel than anything else. So here’s hoping for more worthy roles for her soon. Though Katrina did fight back and remind Henry that he is still human no matter how much he tries to deny it. Despite the overwhelming “Indiana Jones and the Last Crusade” vibe with the whole ‘choose the right sword’ thing, I was incredibly happy that they threw in a little Greek Mythos in here too with the Gorgon. If you were really sharp, then the moment you saw the stone statues you saw it coming; and quickly after that the Headless Horsemen of Death would be the only way to stop it. Though all of this couldn’t compare to the actual face off between Ichabod and Abraham. We’ve seen so much of Abraham and Ichabod through their relationships with Katrina, that we never got to see much of their preexisting friendship. It was because of Abraham that Ichabod first came to the colonies and then joined up in rebellion against the British. Though this isn’t the picture Abraham paints when they dual. Abraham has been so twisted by the darkness and his own hatred, that he blames everything on Ichabod and can’t even remember the true reasons Ichabod came to the colonies – he was invited by Abraham, not a stow away. In the end, Ichabod got the upper hand in swordplay, which led Abraham to break the rules of combat and retrieve his shotgun. Though rather than kill Ichabod, Abraham chose to let him live – preferring to see him suffer through Hell than have a quick death. Now you could say this just shows how much of Moloch’s lap dog Abraham is; but then you have to remember what the end really means and what will happen next. With the horn blasts echoing throughout Sleepy Hollow, the end is near. The Horsemen have gathered – or at least two of them have – and Moloch is ready to begin the end of times. Though there is still more to be loss. As you remember in the earlier episodes of this season, there is a binding ceremony that must still apparently take place between Abraham and Katrina. This is what Abraham wants Ichabod to witness – the beheading and binding of Katrina to Abraham to make them the same. If this goes through, will Katrina possibly be one of the remaining Horsemen? Now the episode title “Magnus Opus” – meaning great work – could refer to the whole undertaking both sides are going through (i.e. : beginning the end of the world, finding a legendary sword, etc). Though the most apparent meaning of these words is the episode itself as a whole. 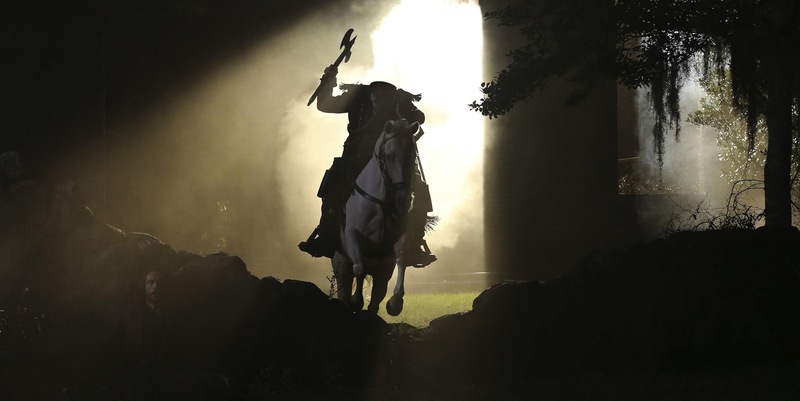 From the Ichabod/Abbie dynamic to once again showing the Horsemen of Death as a powerhouse to be fear, this episode brought back so much of what we loved about Season One. Yes, it’s been sad that a great villain is the hero of his own story; but nothing compares to the frightening presence the Headless Horsemen brings with him. This show is all about heart, mystery and fear; but not the bloody gore kind of fear. The Horsemen might not be as CGI’d and made up as the Wendigo or Incordata; but you can’t deny his stature and abilities strike fear in anyone unlucky enough to stare him down. The stakes are higher and if this is any sight of things to come, then the writers will reward us with next episode. Things are already growing to Biblical proportions, so let’s just sit tight and wait one more episode. What will happen next week? Who knows; but you can be sure that it’ll make perfect sense once we take a look back at the season and see all the hints leading up to it. So stay tuned for next week’s chilling midseason finale and then come back here to break it all down. I thought this episode was on the too much action not enough explanation and story development but it does serve to set up things, I believe, for the final episode of the season. Gosh, I sure do not hope Katrina becomes the final horseman. I love Katrina’s character and part even if she is more of a less combative witch. Yeah! 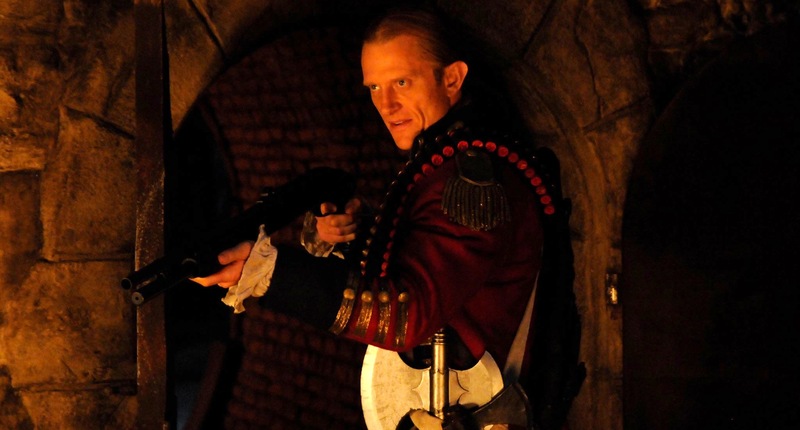 I am not sure what to expect but excited where Sleepy Hollow leads next. Wish the writers dont skimps on the strong story development of the series.